Eating peanuts is an excellent way for people to boost the amount of protein in their diet. Peanuts are widely available and provide several essential nutrients. Although peanuts are technically a legume, which means that they belong to a group of foods from a specific plant family, most people consider them as a nut. Peanuts contain a range of polyphenols, antioxidants, flavonoids, and amino acids. Research has shown all of these components to be beneficial to human health. According to the nutrient database that the United States Department of Agriculture (USDA) has created, 100 g of peanuts contains 567 calories and the following quantities of other nutrients. Almonds have become increasingly popular in recent years, and they are now readily available in many places. They contain slightly less protein than peanuts, but make up for it with other nutrients. Almonds may be the perfect snack for people who are looking for a healthful, protein-rich alternative to potato chips or pretzels. Pistachios contain plenty of protein and other vital nutrients. 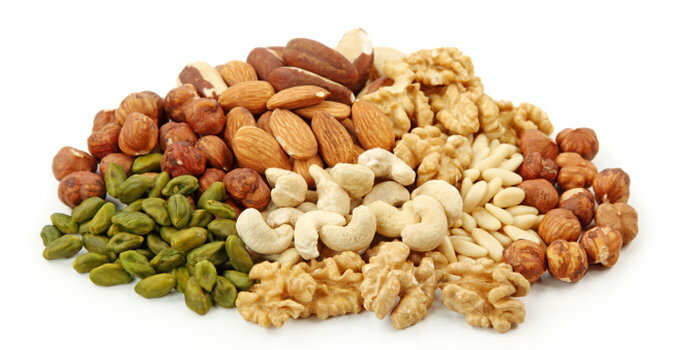 They are also a source of healthful fatty acids and antioxidants. The popular green nut is technically a seed of the pistachio tree, but people generally view it as a nut due to its appearance and feel. A study published in Nutrition Today noted that eating pistachios has a beneficial effect on blood pressure and endothelial function, which may lead to a reduced risk of heart-related health issues. Cashew nuts on wooden spoon. Cashews are rich in monounsaturated fats. Cashews have a creamy texture that makes them a great addition to many dishes and snacks. As reported by the USDA, 100 g of cashews contains 553 calories. Walnuts are higher in calories than some other nuts despite being lower in carbohydrates than many of them. The high calorie count is due to the very high fat content. However, the fats in walnuts are predominantly PUFAs, which may offer several health benefits. While walnuts are known for their healthful fat content, they are a good source of protein and other nutrients as well. 100 g of walnuts contains 654 calories.